Out of India’s 37 indigenous cattle breeds, a large number come from Tamil Nadu. These include the Kangeyam, Thiruchengodu, Bargur, Palamalai, Alambadi, Kollimalai, Vadakarai, Manapparai, Umbalachery, Irucchali, Pulikulam, Thambiran madu, Thenpandi, Thondainadu, Thurinjithalai and Punganur. Out of these, the Pulikulam breed, a native of the Sivagangai district, is mainly used for Jallikattu in Tamil Nadu. ‘Jallikattu’, otherwise known as ‘Eru Thazhuvuthal’ (Tamil for ‘Bull Embracing’) is a sport that has been played in southern Tamil Nadu during Thai Pongal since the Sangam Period. With the advent of green revolution, due to farm mechanisation, the use of draught animals has decreased drastically. According to the last Livestock Census of India, while the indigenous cattle population has decreased considerably, exotic and crossbred cattle have increased. Indigenous breeds and hybrids with dominant native genes produce A2 milk, which is good for human health. Jallikattu is considered to be a bio-cultural sport as it helps to conserve native cattle breeds. But, fortunately or unfortunately, the Supreme Court of India banned Jallikattu on May 7, 2014, based on a plea by the Animal Welfare Board of India (AWBI) and People for the Ethical Treatment of Animals (PETA). I personally feel that the ban was a blessing in disguise. That is because in the past, when the event was organised without proper regulations, many young men who participated in the bull fights had lost their lives, leaving their wives and children widowed and orphaned. The participating bulls were tortured by biting their tails and fed with alcohol to make them more ferocious. The bull tamers were also in the habit of consuming alcohol before joining the event. But, the massive, unprecedented and peaceful protest organised by the people of Tamil Nadu, referred to as the ‘Jallikattu Uprising’ in support of Jallikattu forced the government of India to clear the ordinance proposed by the Tamil Nadu government and a suitable order was issued during January, 2017, as an attempt to preserve the cultural heritage of Tamil Nadu and ensure the survival and well-being of native breeds of bulls. Subsequent to the order permitting the sport, many restrictions were imposed for the safe and smooth conduct of the bull fights. Medical check-ups for both, the participating men and bulls were made compulsory, with necessary dos and don’ts to avoid any untoward incidents. Otherwise, if the sport is banned permanently, the Pulikulam breed also may vanish gradually. The sale prices of this breed plummeted to an all-time low in and around Madurai because of the ban on Jallikattu. When there was a ban on the sport, the condition of the Pulikulam was pathetic. People were not ready to accept any newborn calf even free of cost. Instead, they started demanding money from the owners of the animals. Farmers started selling the bulls to slaughter houses of Kerala. But once due permission was granted by both governments, the entire situation changed. Those who were interested in rearing Pulikulam bulls started bribing cowherds to inform about the delivery of a male calf after noticing any pregnant cow in the herd. A newborn Pulikulam calf fetches around Rs 10,000 per head. The staging of cattle fairs helps farmers to identify viable stock which ensures a vigorous progeny. We can have sustainable agriculture only through native cattle breeds as they help in maintaining pest control and soil health and yield milk with minimum maintenance cost. Besides, they are resistant to climate change. The breed derives its name from the village from where it originates: Pulikulam in Sivagangai district. It is said that this village derived its name ‘Pulikulam’ (Tiger Pond) a few centuries back, because of the presence of tigers in the dense forests that used to quench their thirst in the pond. It is said that the bulls of the village were capable of fighting ferociously with tigers. It is also bred in Madurai, Virudhunagar and Theni districts in Tamil Nadu. ‘Palingu maadu’, ‘Mani maadu’, ‘Jallikattu maadu’, ‘Mattu maadu’ and ‘Kilakattu maaadu’ are the other names of this breed. This indigenous breed is popularly used for Jallikattu. It is a drought-resistant breed and is used as a draught breed rather than milk production as the yield is less compared to other breeds. It supplies good manure and muscle power for ploughing the land, thus contributing to significant organic farming. The Pulikulam’s population of around 90,000 in 1995 has come down drastically to about 16,000 animals in recent years in and around Madurai district. In the past, the Yadava community made up 99 per cent of the cowherds rearing the Pulikulam, while the remaining 1 per cent was from the Mukkulathor community. But now, the trend has changed. Many people of different communities rear this breed for the sake of Jallikattu as it is considered to be a prestigious sport. In the past, this breed was maintained in the villages from October up to the harvest season in January and then would be let loose in the nearby hills and forests for grazing. But the restrictions by the forest department for grazing and penning inside the forests led to the dwindling of their numbers. Today, these animals are penned overnight in the fields of private individuals where their urine and dung fertilises the soil. Farmers from Kerala pay Rs 10 for a kilogram of this breed’s dung, which is used as manure for cash crops such as pepper and cardamom. This breed is resistant to foot-and-mouth disease, tuberculosis and brucellosis. Generally, the males will be dark grey in colour while the females will be white or grey. While the males have large humps, the females have small ones. The bulls are very vigorous, strong and swift. They are aggressive and hav the power of endurance. The price of a 6-month-old male calf is Rs 20,000-Rs 25,000. 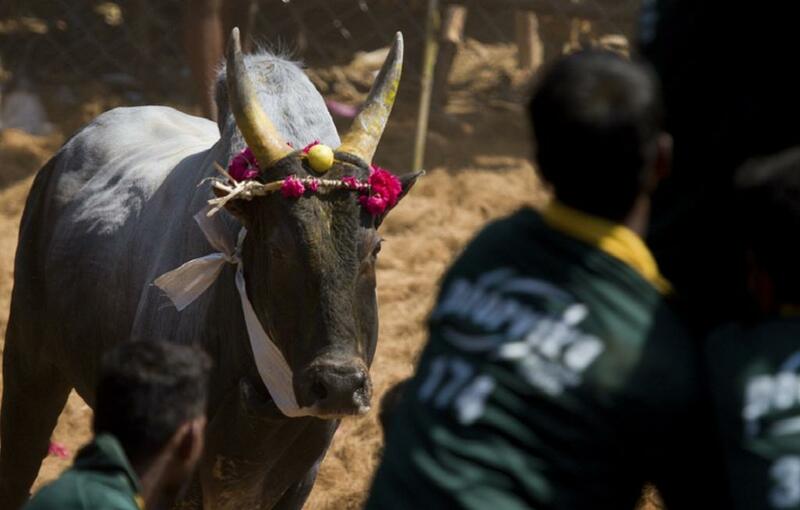 If a mature bull is undefeated in Jallikattu, its price can go up to Rs 5 lakh. The Breed Registration Committee (BRC) of National Bureau of Animal Genetic Resources (NBAGR) under the control of the Indian Council of Agricultural Research (ICAR) has approved and registered Pulikulam breed as an indigenous breed with the accession number ’01 Pulikulam Tamil Nadu INDIA_CATTLE_1800PULIKUOLAM_03035’. Jallikatttu events were organised only in a few places in and around Madurai in the past. But after the ordinance permitting the event was passed in 2017, in many parts of the state, Jallikattu is now organised in a grand manner, with proper procedure, after getting due permission from the district collector concerned. The mega Jallikattu organised in Viralimalai of Pudukottai district on January 20, 2019, with 1,353 bulls and around 500 tamers, has created a world record. Though medical centres and emergency operation theatres were arranged in advance to treat persons with simple as well as grievous injuries, two persons were gored to death. Fortunately, insurance has now been introduced for the first time not only for the tamers and the bulls, but also for the spectators. Valuable prizes distributed to the best bull-tamers and the owners of the best bulls include two cars, 10 motorcycles, 700 bicycles, gold and silver coins and home appliances. Thus the lifting of the ban on Jallikattu, a historical sport considered to be a sign of bravery in Tamil Nadu, has helped the survival and betterment of the rare Pulikulam breed.